Seattle won, 8-2. Of the 62 games the Mariners have played since July 1, this was just the 27th time they scored four or more runs in a game. ANAHEIM, Calif. — Way back in February when Scott Servais would think about the Mariners’ lineup and its run-scoring potential, the showing on Thursday night was sort of how he envisioned it functioning — quality at-bats forcing pitchers to throw strikes, a plethora of base runners, some situational hitting and a home run to top it off. Sure, Seattle’s 8-2 win, which included 12 hits, seven walks and a massive three-run homer from Nelson Cruz, came against a steady parade of “meh” — otherwise known as the Angels’ bullpen — but it was still an aggravating reminder that this offense could be something more than inconsistent and anemic for far too much of this season. Indeed, these types of offensive showings have been rare for the Mariners far too often. And while Servais was happy to see it, there was a tinge of frustration knowing he hadn’t seen it enough. Since July 1, the appearance of those sorts of showings have been pretty scarce. Most nights, Seattle struggles to generate one of those four aforementioned facets to successful run production, let alone multiple aspects. Of the 62 games the Mariners have played starting on July 1, this was just the 27th time they scored four or more runs in a game. Seattle is 18-9 in those games, which should still be better. But 35 games of scoring three runs or less just isn’t going to work. The Mariners won nine of those games. That’s how you blow an 11 1/2 game lead in the second wild card. Had this version of the Mariners’ offense surfaced a little more, veteran right-hander Mike Leake wouldn’t have gone the better part of two months without picking up a win. Buoyed by the unusual run support, Leake pitched seven innings Thursday, allowing just one run on four hits with a walk and five strikeouts to improve to 10-9 on the season. His only run allowed came in the seventh with his pitch count over 100 and the Mariners leading 6-0. Leake left a 2-2 slider up to Justin Upton, who smashed a one-out solo homer. But Leake calmly finished the seventh inning, retiring the next two batters. It was his 18th quality start (six innings pitched, three or less runs allowed) of the season and the eighth time he pitched seven innings or more. 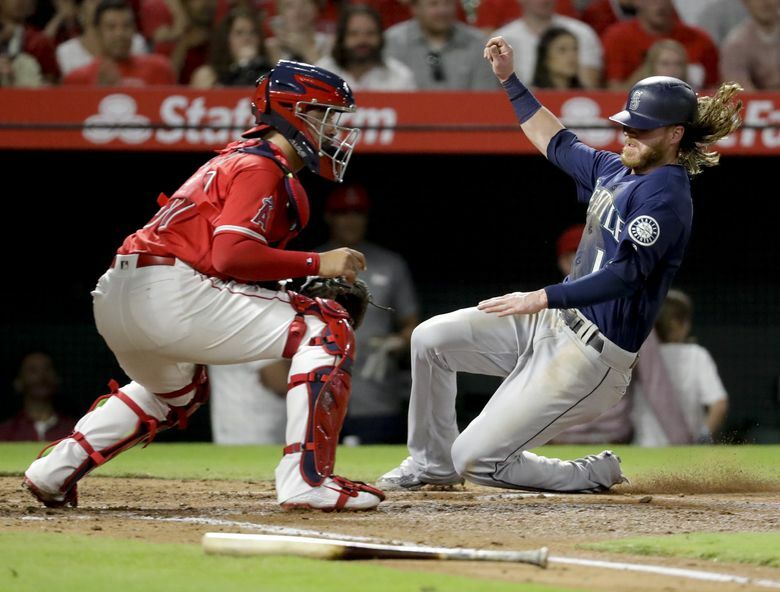 Facing a bullpen start from the Angels, the Mariners picked up two quick runs in the first inning off “starter” Odrisamer Despaigne. Mitch Haniger led off with a double and later scored on Robinson Cano’s sharp single up the middle. Denard Span, who drew a walk batting in the No. 2 spot, scored on Ryon Healy’s sac fly to right field. The Mariners picked up another run in the second. Three straight singles from Ben Gamel, Mike Zunino and Dee Gordon set up Haniger’s sacrifice line drive to left. Seattle might have gotten a couple more runs if Span’s hard line drive to center wasn’t run down by Mike Trout. The Mariners broke open the game in the fourth inning when Haniger and Span both singled off right-hander Noe Ramirez and Cruz smashed a towering homer to deep center to make it 6-0. It was Cruz’s 36th homer of the season and his 50th career homer vs. the Angels. Only Alex Rodriguez (72) has hit more homers against the Angels. After not adding runs — despite ample opportunities over the fifth through eighth innings — Seattle tacked on two more in the ninth. Kyle Seager smacked a single into right field off right-hander Deck McGuire to score the not-exactly-fast Cano from second base. Zunino later worked a bases-loaded walk off McGuire despite falling behind in the count 0-2 to make it 8-1.